To create a script, launch a script wizard by double clicking Generate Script icon on the main window. The first wizard dialog offers you to choose which task you'd like to script. After choosing a task you are going to follow exactly the same wizard as you'd do when executing a task manually. 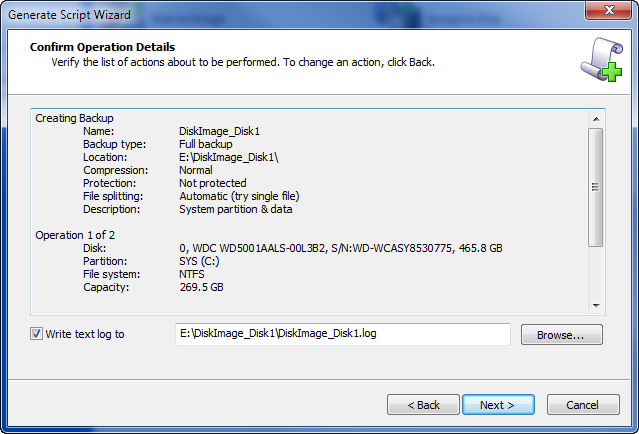 For example, if you select Script Type as Disk to Image, you will be guided through the same dialogs as in Disk to Image wizard (selecting a backup type, disk and partitions to backup, backup location, options and confirmation). The main difference from the regular task wizard is that instead of proceeding with the execution of the task after a confirmation dialog, you'll be presented with another dialog named Save Script File. It shows a generated script text and allows saving the results either to a script file or to clipboard. There are two ways to create and execute a script - as a script file or through command line parameters. A script file has an extension .DIS and follows a simple key=value structure. Using command line parameters allows to avoid using a separate script file and passing all script values to Active@ Disk Image as parameters. Keep in mind though that sticking with command line parameters may create a very long a cluttered command line. The task parameters the wizard describes are placed in the [task] section in a script file. Normally there would be only one [task] section in the file but in some cases wizards may produce more than one task. 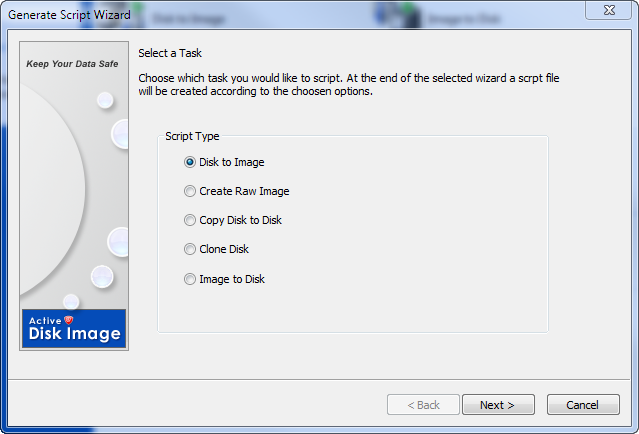 For example, if you create an image of more than one hard disk and turn on the option "Create separate images for each disk", script wizard will generate several tasks, one for each image to be created. Those tasks will be executed as independent entities one after another. Command line parameters allow describing only one task, so there will be more than one set of command line parameters generated, each of them representing a separate call of Active@ Disk Image.